We are all witnesses to the Free Agency period of the summer, 2010. It is less than 24 hours away. The scope of the NBA will be completely altered and fans will “witness” a new day for the League. For the past decade, the NBA has been dominated by the Western Conference. 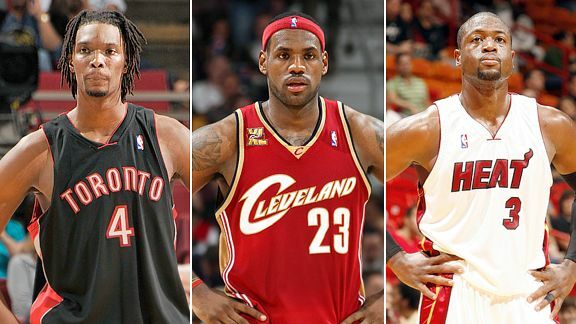 For the decade before that, the Eastern Conference reigned supreme (Michael Jordan era). Now it is up for grabs. As the world braces itself for the Free Agency period of a lifetime, we have 24 hours left to reflect on the NBA that was. Because it will be no more.. I know most of you are probably sick and tired of hearing about the NBA Free Agency period of 2010. I will admit it is turning into a Brett Favre type saga. The only difference is this story actually has a valid excuse for being talked about every day for over 2 months. This is not about one player’s selfish cry for attention. This is a story that involves the entire League. It is a story that is honestly bigger than the game. Now I will admit that I have no idea what is going to happen during this Free Agency period. I can speculate like all of the other experts and analysts. And I have my opinions and theories on who will go where and why. But let’s be honest, nobody is sure about what will transpire over the next few weeks. People can hypothesize, but there are no sure-fire take the bank type facts. The only way to actually get a better idea would be to sit at the player’s roundtable, which sounds similar to a League of Extraordinary Gentlemen type event. And wouldn’t you know it, 2 more marquee names added themselves to the Free Agency pool last evening (Paul Pierce and Dirk Nowitzki). So heading into the final 24 hours before the insanity begins, lets take a look at what players are on the market. You have both your Superstars and your All Stars in this class (and of course other solid players that are getting no mention this offseason). I will also put in parenthesis next to each player where I think they will land (no analysis will be provided though). This is just a small crop of the marquee names available. There is much more out there, but these are the guys who have been getting the majority of the press. In a way, all of this buildup, preparation, and hype, could be compared to a Presidential election. Teams have been cutting salary in any way possible over the past 2 years in preparation for this July. This is sort of like fundraising for a campaign. It has all been about positioning. In addition, teams have been wooing players in any way possible that falls within the rules for well over 2 years. The same way Presidential candidates try to woo people to vote for them by touring the country making speeches. Lastly, the entire NBA is involved in this. This is similar to how the entire country is involved in a Presidential election. The only difference between this and a Presidential election really other than voting is that this will have an effect on the entire League for well over 4 years. The Presidential election only results in a 4 year contract while most of these contracts will be for more than 4 year periods (and their impacts on the League will extend for well over a decade). So there you have it. I would love to give you further analysis and reasoning on my predictions on where everybody is going to land and what is going to happen during the course of this bonanza. But my predictions, similar to the experts like Bill Simmons, Tim Legler, Tony Kornheiser, Michael Wilbon, etc are all void in that nobody really knows what is going to happen (as I stated before). This is truly an enigma and is the only reason why I and most people can tolerate all the attention it has been getting each and every day for the better part of 3 months. Get ready for the dawning of a new day in the NBA. Also, if you would like to see a conversation that I had with a fellow sports enthusiast/blogger (Bryan Setz) a couple of a days ago, who has a blog called 3 Cats 1 Nut, go to http://www.3cats1nut.com/ and check out the gist of the conversation. 82? What significance does this number play? Why would anyone write about the number 82 being significant. In no culture in the world is 82 thought of as good or bad. It is just another number. Well maybe it is a bad omen for Americans. 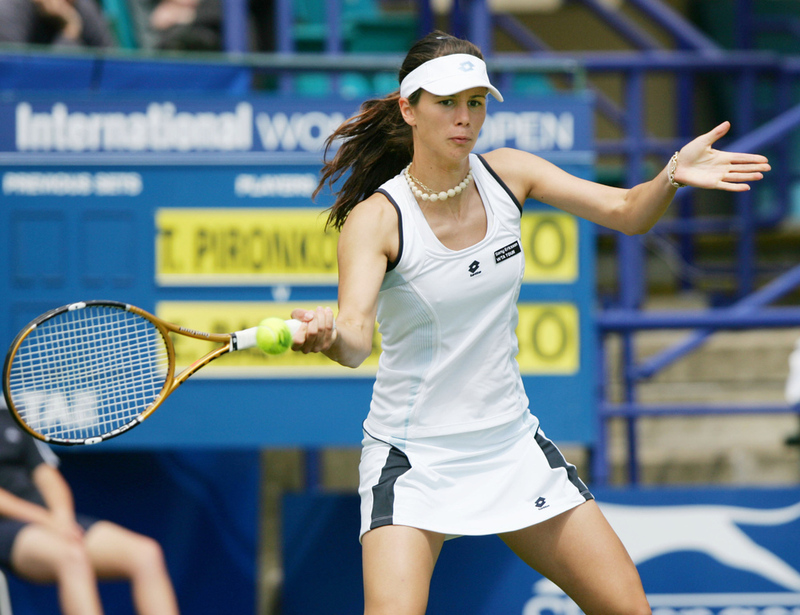 Tsvetana Pironkova, the 82nd ranked player in the world, handily defeated Venus Williams at Wimbledon today.
. Want to know what Lu and the Bulgarian Pironkova have in common? They are both ranked 82nd in the world! Two players ranked 82nd in the world defeated two Americans ranked in the top 10. What is going on? Is this a coincidence or does it have significance? Most likely a coincidence, but lets look into the number 82. The number 82 is a happy number. There is a whole complex process on how one knows what is a happy number. But the point is, numbers are either happy or sad (if you want to know how this is derived go to(http://en.wikipedia.org/wiki/Happy_number). So maybe the number 82 is not so happy for Americans. – If you are a Cincinnatian, you do not like the number 82 because in the year 1982, Joe Montana and the 49ers broke the heart of all Bengals fans, winning the Super Bowl in dramatic comeback fashion. – If you are an NFL fan, you do not like the number 82, because in 1982, the NFL had its first strike ever which lasted 57 days. – For the MLB fans out there, in 1982, the All Star Game was played outside of American soil for the first time in Montreal. This could be a good or bad thing. – For all my fans of film, Rocky III came out in 1982. And though this was a great movie, Mick, Rocky’s beloved trainer dies. Also Rocky struggles to cope with the civilized lifestyle and appears to have lost his moxy. – Lastly, in 1982, the DOW sank to a new low for the time and America was engulfed in a deep recession. So you decide for yourself if the number 82 is bad luck. Either way, two players ranked 82nd in the world have knocked off two top 10 ranked Americans at the premier event that tennis has to offer. Not a day of celebration for Andy Roddick or any of the American men today at Wimbledon. What is the deal with American men’s tennis? Why aren’t we dominating the scene like we did in the 90s? This is an enigma to most tennis experts as no American male has won a Grand Slam title in 7 years and this drought will probably continue for at least another decade.. It was a tough day at Wimbledon today on the men’s side for the USA. The final 2 Americans left in the men’s draw, Andy Roddick and Sam Querrey, went down. Roddick’s loss was especially tough, in that his opponent only had one break point opportunity the entire match, and converted on it to beat Roddick 9 to 7 in the fifth. Generally when you give up one break opportunity over the course of an entire match, you are cruising. 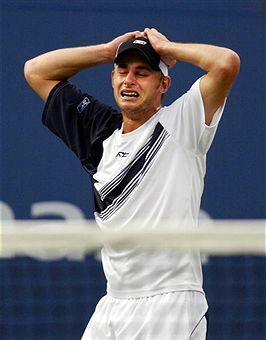 Not on this day for Mr. Roddick, who has really had tough luck with the majority of his career. For those of you who do not remember, Andy rose to number 1 in the world for a short time in the late summer of 2003, when he went on a hot streak and captured his lone Grand Slam Title (the US Open at Flushing Meadows). Since then, Andy has stayed in the top 10, and generally found himself in the top 5, but he has been unable to convert on a Grand Slam Title. He has failed in 3 Wimbledon final’s appearance and 1 US Open final’s appearance since 2003. This in large part has been due to the phenomenal play of guys such like Roger Federer and Rafael Nadal. As I stated on an earlier blog post, Andy’s game is better now than it was in 03 when he reached number 1. Roddick was a guy who once was questioned for his work ethic. This has not been the case for years as he has taken it upon himself to considerably improve the weaknesses in his game such as his backhand and sometimes lack of patience during big time points. These are no longer problems. Roddick unfortunately has been a victim of the times (very tough players at the top). Do not feel too bad for the guy though. He is rolling in money and his wife is a definite DP (dimepiece), having appeared on the cover of this year’s Sports Illustrated Swimsuit Issue (Brooklyn Decker). Roddick is starting to become an elder statesman on the tour though, in that he is 28 years old. So who is the next great American? We were spoiled in the 90s by guys such as Pete Sampras and Andre Agassi. Expectations are very high and they are not being reached. Sadly for the men, we have only 2 players outside Roddick ranked in the top 25 in the world (Roddick is 7th). Though Isner played in an epic Wimbledon match this year, he does not look ready to capture a Grand Slam title anytime soon or even crack the top 5. Then our next guy in line is Sam Querrey, who lost today. Querrey looks similar to Isner and does not appear to be cracking the top 5 anytime in the near future (he is a solid player though). Then we have 4 other guys ranked between 70th and 100th in the world. Fat chance any of these guys will really be making any big time noise anytime soon unfortunately. So the hope for American men to get back into the limelight of men’s tennis appears to not be happening in the next decade. Then on the women’s side, things are not a whole lot better. The top 2 players in the world are the Williams sisters, who are both above the age of 28. Then after them, Melanie Oudin is the next highest ranked American female at 35th, followed by Vania King at 71st, and Jill Craybas at 100. So there are only 5 American women ranked in the top 100 in the world! And the Williams sisters could honestly retire at anytime in that they are getting older and really do not have much left to prove. So the future of American tennis is looking pretty bleak on both sides of the spectrum (especially for the men). Any thoughts on why this is? And I will state that it is not due to a lack of enthusiasm from American youngsters in that tennis is more popular than it has ever been in the states with more USTA members than ever. I will give you one reason though. Many of the “foreign” men’s and women’s players train and spend the majority of their lives in the United States at tennis academies. And then they still are considered to be a “Russian” or “Australian” player, even if they have spent the majority of their lives in the United States. Outside of that though I really have no reasons why the American tennis game has really fallen off the map. It is a serious mystery. What do you all think the issue is? 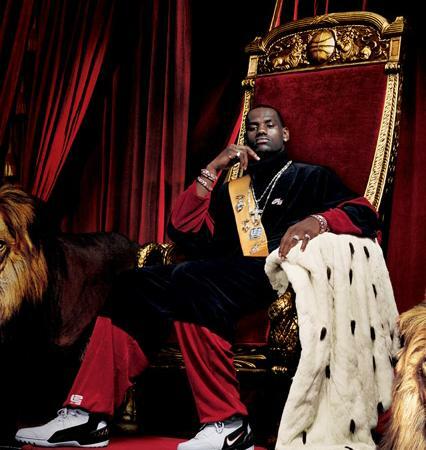 Lebron in his throne, without a crown yet. LBJ truly is the King. If America was a monarchy, Lebron would be wearing the crown. James is not going to visit the teams pursuing him and let them wine and dine him. No, no no. Not with the King. The teams are going to come to him. The NBA world is coming to Northeast Ohio. You have to envy that. And the King comes off very well in that he is saving teams money, not making them fly him out and put on a show in their respective cities. What a philanthropic guy! Lebron will get to sit on his throne and let the teams woo him as best as they can. I wish recruiters would come to my house and try to wine and dine me for jobs.. So the speculation is going to continue. Over the next couple of weeks, you will see pictures of Lebron dawning the number 6 in a Bull’s jersey, in a Knick’s jersey, in a Net’s jersey, and I could go on. Many experts think that they have the mystery solved and the King will be setting up shop in the Windy City along with another free agent gem, Chris Bosh. Not to mention this team already has the supremely talented and up and coming superstar in Derrick Rose. Talk about the three musketeers. Boston has had a great trio the past three years in Pierce, Garnett, and Allen. But this trio knocks that one out of the park at this point in large part due to how young they are. These guys are entering the primes of their careers. I will be honest with you. I do feel Chicago is the best option for the King. It gives him the best chance to win a title now. If that is what truly is priority number 1 for Lebron. But, does the King want to live in Michael Jordan’s shadow for the rest of his life? Or is Lebron’s number 1 priority to become the most recognizable and well-known athlete in the world? If he sets up shop in New York or New Jersey, he will immediately be even more global than he is now. He will be the unquestioned King of these cities, as he is in Cleveland. In Chicago, unless you bring in 6 titles, you will never escape the mega shadow of Air Jordan. Nonetheless, I am still envious of the position that Lebron is in. He gets to sit on his throne and let people come to him. As if he is indeed a real King. He is coming out in a year where there are other superstars that are free agents. So he can easily build up an outstanding team around him by teaming up with another star. Lebron is in a truly amazing position. And it is highly doubtful that next year at this time, his throne will still be in Cleveland..and can you really blame the guy? Tonight is the big night. It is the night where the bright lights will be shining on the Mecca of basketball, Madison Square Garden. It is a dire shame that the bright lights are never shining on MSG anymore for the tremendous play of the New York Knicks. But who knows, maybe the Knicks will put together their first playoff run since the Patrick Ewing days following this wild free agency period that is only a week away. So tonight, many of last year’s college studs will be in the limelight decked out in fancy suits and all smiles for the big evening. This is where these guys will finally be on their way to signing the big pay-day. I have come up with 5 main storylines for this evening’s gala. 1. Where is the talent? – Many are calling this a 4 player draft. Experts are saying that John Wall, Evan Turner, Demarcus Cousins, and Derrick Favors are the only real impact players coming out this year. And even out of these four, there are many question marks surrounding Favors as a possible Kwame Brown repeat and Cousins as a player with major maturity issues (some have compared him to a Zac Randolph type). There is the occasional guy who is clamoring that Wes Johnson will eventually become an All Star in this League as well. There are always surprises though in how some of these players pan out though. The experts are never entirely right. 2. I thought the world was becoming flat? – There are only 3 to 4 European/Foreign players on the entire draft board this year. Maybe the mighty influx of European talent is coming to an end? I do not think this is the case, but this year, the talent cupboard is very bare from overseas (and in the States for that matter). I guess we are in for a good old-fashioned draft of mainly NCAA players. It will be nice to have a draft where you have heard of and know something about all of the guys being drafted. 3. Where are the graduating seniors? – Most experts have 0 or 1 graduating seniors being drafted in the entire first round. The rest of the potential draftees are early entrants. And this is not due to a plethora of foreign talent (see point 2). I guess the days of developing stud players over the course of a 4 year period are over. The concept of a “program” is becoming a 1 or 2 year thing these days. The face of both the NBA and College game continue to change immensely. 4. I thought you must be 21 to be legal? – This question kind of piggy backs off of my last point. There are 50 early entrants in this year’s draft. Yes, you heard me right, 50! You know how many there were last year? 33 total. And the year before that there were 39. Generally there is a large group of guys who pull out of the draft 10 days before the big day in order to keep their college eligibility and remain in school. This was not the case this year. So I guess the struggling economy is leading these young guys to crave dollar bills now? Or maybe the possibility of a strike is leading some of these guys to rush to the League? Either way, a good 15 to 20 of these guys will go undrafted and have many important life decisions to make come tomorrow. I guess only Coach K has found a way to get guys to stay for 4 years in this era of one and dones and early departures (see Kyle Singler). 4. Is this just a precursor to the real party that starts on July 1st? – This whole draft for most teams is revolving around positioning themselves for the madness that is this year’s free agency period. As I said before, the talent in this draft is slim to none according to most experts. The free agency market is by far the most talented of all time. Be ready for a lot of trades going on tonight as teams try to snag some veteran talent and teams try to free up cap space in order to sign some of the big name guys on the market next week. I mean the draft is always important, but this year it is vastly overshadowed by what is to come in July. 5. Is this the John Calipari show? 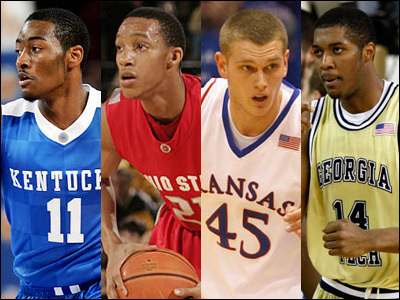 – The school that is getting the most notoriety in this draft is that storied program from Lexington. A team that somehow did not even make the Final Four. John Wall was proclaimed the number 1 pick what seems like an eternity ago. Even the King himself, Lebron James, said that Wall would be the number pick last December! You want to know something very interesting though? Kentucky has the most wins out of any program in NCAA history and is widely considered the most storied team, yet they have never had a player go number 1 in the NBA draft. Kind of surprising, but that all changes tonight. The real question is will John Wall show David Stern the “John Wall Dance” on stage? In addition, most experts have 5 Wildcats being selected in the first round tonight. This would break the previous record of 4 players from one team going in the first round of the draft. So be looking for John Calipari in a very expensive suit, dawning his amazingly smooth hair, and grinning from ear to ear all over the television cameras tonight. It is a shame that he is not getting a piece of the money that his former players will be getting soon. Or maybe he is (just kidding). So those are the five main storylines for tonight’s draft from Sportskraze. I will leave you with one more thing though. As I have stated on previous posts, the NBA has become a League all about length. Teams that have the most length at all the positions are the ones that are at the top of the League. See teams like the Lakers, Celtics, Magic, and Cavaliers. So looking at the crop coming out, guys like Turner and Wall will be successful in that they fit in this mold of being very long at their respective positions. Enjoy the Draft tonight. Hopefully it won’t be long before Madison Square Garden is back on the map for the play of its beloved Knicks..
A couple of days ago I wrote a post entitled, “Proud To Be An American.” In this post I discussed why I love the sports that Americans tend to prefer such as basketball, baseball, and football. And basically talked about how soccer and the World Cup is nice, but it is not even on the same level as the American big 3 (baseball, basketball, football). I still stand by this statement. But today was a day full of amazing sporting occurences in the non macho American sports. Today was a day dominated by a thrilling end to a World Cup game that sent the American squad to the round of 16 and the longest tennis match of all time. And the scariest part. The tennis match is still not even over yet. John Isner and Nicolas Mahut head into Thursday still not knowing if they have advanced past the first round. How many times do players head into Thursday without having advanced to the 2nd round of a Grand Slam? So earlier today the American soccer team took on an Algeria squad looking to dash the Yanks’ dreams of making it out of pool play. The refs once again really hurt the Americans and took away a Clint Dempsey goal on an abysmal offsides call. Heading into extra time of the 2nd half, the Americans appeared to be headed home. And even though they were on the attack for the majority of the game, they could not seem to find the back of the net. England had won, and with a tie, the Americans would fail to advance beyond pool play for a 2nd consecutive World Cup. Then all of the sudden Algeria got a decent shot on goal. And the Americans went on the counterattack. Landon Donovan, who I am not calling the Derek Jeter of US soccer, put the ball in the back of the net and did a beautiful head first slide onto the grass in celebration (did he learn how to slide like this from Derek Jeter?). 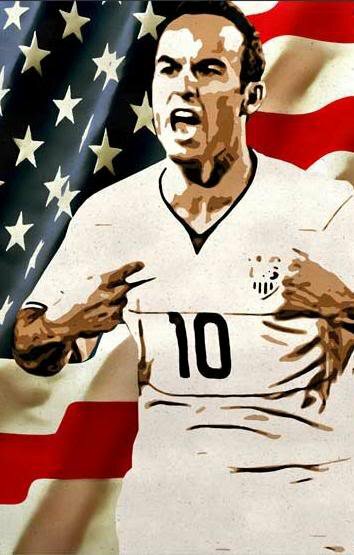 A sigh of relief rung throughout the American soccer nation. What a disappointment it would have been to fail to advance out of pool play again. The Americans live another day in the World Cup. Then the other exhilarating sporting event of the day. A first round tennis match at Wimbledon. John Isner, one of the top ranked Americans in the world split the first 4 sets with Nicolas Mahut on Tuesday and headed into Wednesday expecting to probably finish the match within an hour. Boy was he wrong. Their 5th set is currently knotted up at an astounding 59 to 59! Their 5th set has lasted longer than any other full match in the history of the game. The total span of the match thus far is over 10 hours. And they still are not finished. The previous longest match ever was 6 hours and 33 minutes in a 2004 battle between Fabrice Santoro and Arnaud Clement. The 5th set alone in this match has lasted longer than that entire match. How are these guys still standing? Running a marathon would be easier than this. It is a shame that this match is on one of the side courts and is not between 2 high-profile players, but it is still epic anyways. Hats off to both of these amazing athletes and it is a dire shame that only one of them gets to advance into the 2nd round. Also Isner and Mahut will forever be linked and in the record books with this astonishing battle. So even if Isner never develops into a Grand Slam Champion like most Americans hope and expect he will become, he will always have this match to talk about. So there you have it. A day of amazing excitement in the non big 3. A day of major excitement even for the Americans.